CarHDRom version 13 is an Android 8.0 Oreo-based custom ROM for Galaxy S8 Plus. The firmware has been released on XDA Developer forum by a Recognized XDA Themer, Carotix. The ROM is fully Debloated, which means, no unwanted apps are pre-installed. CarHDRom v13 is pre-rooted ROM via SuperSU. The User Interface is tweaked with Oreo Aroma Theme. The ROM is fully optimized for a better performance with a lot of mods like ScreenCapture, Volte Toggles, and Custom BG in Pulldown. You can quickly install CarHDRom v13 Oreo Custom Firmware on Galaxy S8 Plus using the tutorial below! NOTE: This OS is not an Official Firmware by Samsung, but a custom ROM which would require a custom Recovery like TWRP in order to flash the firmware package. If flashing via TWRP Recovery is not a new task for you, this guide would not be much difficult. We have covered entire step-by-step tutorial so that a new user can perform the flash easily. If you are on Android 7.0 Nougat, you need to make the transition to Android 8.0 Oreo. For doing that, you need to FORMAT DATA from recovery option, so your internal memory will be wiped out – like a brand new device. Proceed to the tutorial below, ONLY if you own any of the above-mentioned Galaxy S8 Plus models. This awesome Custom Firmware comes with a lot of cool new features based on Android 8.0 Oreo. A quick list of main features is given below, and we hope you would love to use it on your device. LIKE this Custom Firmware for Galaxy S8 Plus? We love it too, and we know you are looking forward to installing it on your phone. Please read the important information below before starting the tutorial. Make sure you have correctly installed Galaxy S8 Plus USB Driver on your computer. If not, please download it from our USB Driver Section below and install it correctly. Otherwise, your computer will not be able to detect your device. Samsung users can use Smart Switch to backup data on the computer. Samsung Smart Switch even allows the users to move data from one device to another of different variant (like moving data of Galaxy S7 to Galaxy S8). 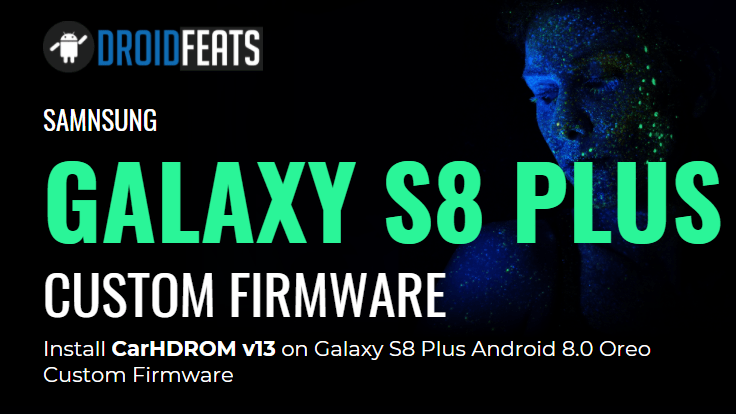 We have mentioned full step-by-step instructions on How to install CarHDRom v13 Android 8.0 Oreo Custom ROM on Galaxy S8 Plus. If you are entirely new to rooting, flashing a Custom ROM or an Official Firmware, please read the entire tutorial once before actually performing it on your device. Step 1: Download CarHDRom v13 Android 8.0 Custom ROM for Galaxy S8 Plus on your computer. Hurray! Your Galaxy S8 Plus should have got CarHDRom v13 Android 8.0 Oreo Custom Firmware installed by now.